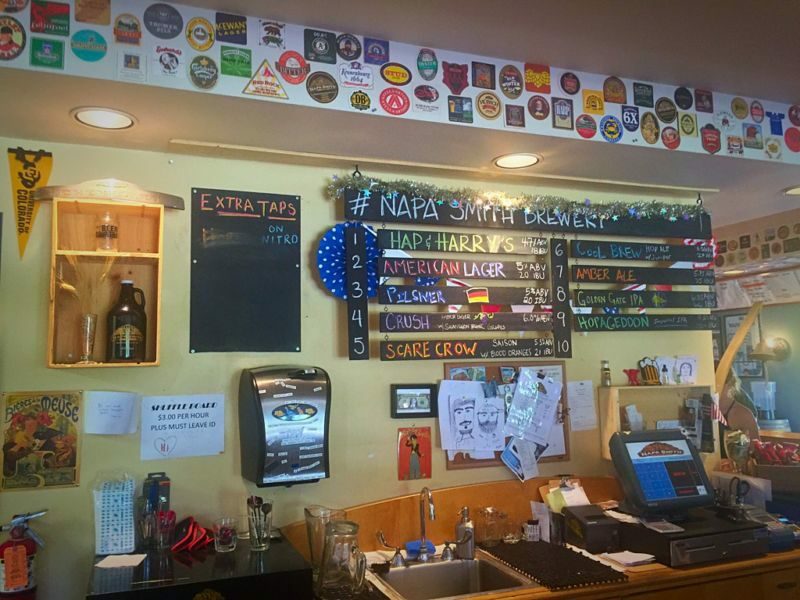 Napa Smith Brewery is in a unit of a small industrial park on the junction of Highway 29 and Highway 12. Neither this location, nor the warehouse building invoke thoughts of an English pub. The interior, with its dartboards, barstools, and odour of beer offers a better imitation. A beer-garden adds to the partially implemented illusion. 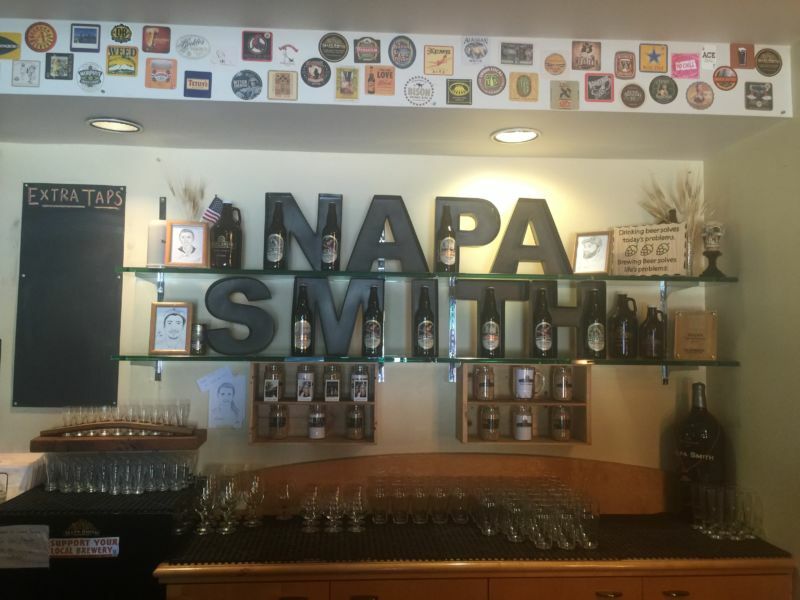 I had tasted Napa Smith beers on a couple of occasions and had been impressed enough to put a visit to this oft passed location on our “Places to Visit” list. As an aside, that list is not a notional concept, but an actual set of places entered into software that is synced between my various devices. The problem has always been that we were passing it on the way to or from Napa Valley. In the former case, we had plans to drink wine and did not wish to delay our arrival. In the latter case, we had partaken of the grape and so drinking beer did not seem advisable. California Girl had seen that they had started doing wine-flights and had tweeted an offer for a free tasting. 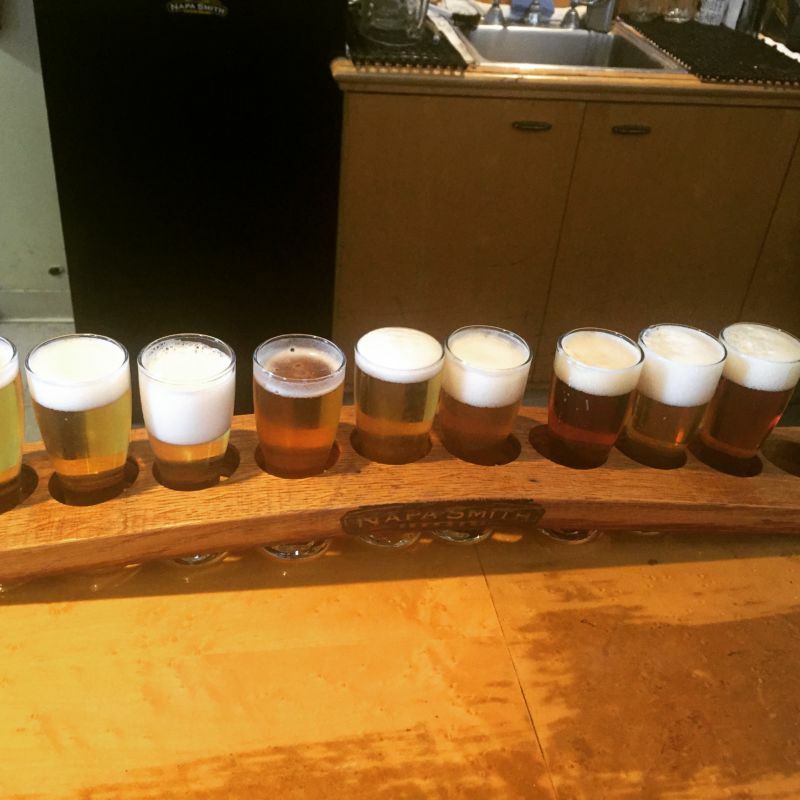 We took them up on this offer and since we were there, I decided to try their beer sampler. For those readers in the UK who recoil from the idea of drinking beer in the US, let me reassure you that over the last couple of decades American brewing has stepped out of the shadow of the big manufacturers of ice-cold taste-free “beer”. There are now countless small craft breweries across the country making a range of beers, most of which have actual flavour. I decided to try their beer flight; a taste of the nine beers that they have on tap. That list raised a couple of concerns; there was no dark beer and several of the beers had added flavouring. I have, in recent years, found porters, stouts, and other black beers to be my favourite style of craft beer. I am also a traditionalist when it comes to beer; hops, barley, yeast, and water is all that should be present. Rice is fine with a curry, fruit belongs in cocktail; neither has any place in beer. I would have preferred if one or more of the beers had been dark; I know that Napa Smith does brew stouts and porters. However, the nine from which I sampled offered a wide range of tastes. To my surprise those with added ingredients worked well, in the main. Of particular note was The Crush which in a nod to Napa’s main drink had Sauvignon Blanc grapes added. This beer had a bright acidity that combined with well-balanced hops to make an enjoyable drink. The final beer, the Hoppageddon, was too strong and sweet for my taste. I did not finish this one, but that was a reflection of my preferences and not the quality of the brew. My one criticism was the service of lack thereof. I ordered the flight, which was put down in front of me by the barmaid who made no attempt to explain the beers; she merely indicated the board behind the bar that listed the various brews. At no point during my tasting did she check in to see how it was going or if I had any questions. There were perhaps three or four other people at the bar, so the lack of attention was not the result of a constant need to help other customers. Once finished, there was no sign of her and the other server showed no interest. We left cash for the flight and exited the establishment. In summary; good beer, shame about the service.